Bernadette Soubirous, on February 11, 1858, went with her sisters Toinette and Jeanne Abadie to collect some firewood in order to buy some bread. She stopped to take her shoes and stockings off to wade through the water near the Grotto of Massabielle, and she heard the sound of two gusts of wind, but the trees and bushes nearby did not move. From the darkness of the alcove came a “dazzling light, and a white figure”. She was dressed all in white, with a blue belt fastened around her waist and the golden yellow roses, one on each foot, the color of her rosary. Bernadette tried to keep this a secret, but Toinette told her mother, and the children received corporal punishment for their story. 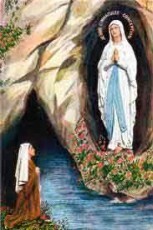 Bernadette returned to the Grotto three days later, and brought holy water as a test that the apparition was not evil, and demanded that if she were from God, she must stay. If she were evil, she must go away. She said the vision only made her grateful when the holy water was cast and she made her demands. Bernadette’s companions had become afraid when they saw her in ecstasy. She remained ecstatic even as they returned to the village. On February 18, she spoke of being told by the Lady to return to the Grotto over a period of two weeks. She quoted the Lady, “I promise to make you happy, not in this world, but in the next”. Soon the news spread all around, and her parents took interest. Bernadette was ordered by her parents to never go there again. People were shocked when they heard her story, and it was on February 24, that Bernadette related that the apparition asked for prayer and penitence for the conversion of sinners. On the next day the apparition asked her to dig in the ground and drink from the spring that would erupt. She did as told, and the stream soon became a focal point for the pilgrimages. As word spread, the water was given to medical patients, and many reports of miraculous cures followed. Many cures were “certified miracles” lacking any medical explanations. The government being concerned fenced off the area and issued stiff penalties for anybody trying to get near it. Lourdes became a national issue in France, resulting in Emperor Napoleon III to reopen the Grotto on October 4, 1858. Bernadette visited the barricaded Grotto under the cover of darkness, and on March 25, she was told, “I am the Immaculate Conception”. On Easter Sunday, April 7, Bernadette visited and was observed to have held her hands over a lit candle without harm, and on July 16th, she visited the Grotto for the last time saying, “I have never seen her so beautiful before”. The Church being faced with nationwide questions, decided to institute an investigative commission in 1858. In January 1860 the local Bishop finally declared that, “The Virgin Mary did appear indeed, to Bernadette Soubirous”. The events established the Marian veneration in Lourdes, which together with Fatima is the most visited Marian Shrine in the world, with 4-6 million pilgrims visiting annually. In 1863, Joseph Fabisch was charged to create a statue of the Virgin Mary according to Bernadette’s description. It was presented and placed in the Grotto on April 4, 1864 with 20,000 pilgrims present. All recent Popes have visited the Marian Shrine, Benedict XV, Pius XI, John XXIII, Pius XII, and Pope John Paul II visited Lourdes three times. On January 18, 1862, Bishop Laurence, the Bishop of Tarbes gave a solemn Declaration, “We are inspired by the Commission comprising wise, holy, learned and experienced Priests who questioned the child, studied the facts, examined everything and weighed all the evidence. We have also called on science, and we remain convinced that the Apparitions are supernatural and divine, and that by consequence, what Bernadette saw was the Most Blessed Virgin. Our convictions are based on the testimony of Bernadette, but above all on the things that have happened, things which can be nothing other than divine intervention”. Because the nature of the apparitions are private and not public, Catholics are not required to believe them. They do not add any additional material to the truths of the Catholic Church as expressed in “public revelation”. In Roman Catholic belief, God chooses whom He wants to cure, and whom he does not, and by what means. Bernadette said, “One must have faith and pray; the water will have no virtue without faith”. Bernadette Soubirous has been canonized as a saint of the Church and her feast day is celebrated on April 16th. Our Lady of Lourdes is a title of the Blessed Virgin Mary, invoked by Roman Catholics in honor of the Marian Apparition that took place in Lourdes, France. St. Bernadette Soubirous was a fourteen-year-old peasant girl that witnessed Our Lady’s apparition. There were a total of seventeen apparitions over the year 1858. Our Lady told St. Bernadette that we were to pray for the Conversion of Sinners, and she stated, “I am the Immaculate Conception”. St. Bernadette was asked to dig in the ground and a “spring” would erupt. She did as she was told, and to this day the water runs. Nearly 6 million faithful make the pilgrimage annually, and hundreds of miracles have been reported through these visits.